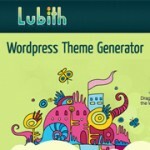 Free WordPress Theme Generator No Coding Required! Millions of sites today use WordPress to build their blog sites, and for good reason too! One of the best open source CMS platforms out there, at least in my humble opinion 😉 However, when it comes to picking the right theme design, it can get a little challenging…not for all, but definitely for some. There are a plethora of WordPress theme developers on the net that create and give away lovely designs for free, and of course there are the fabulous premium designs as well. Now the challenging part is finding that “right” theme for your blog….let’s say you found a great wp theme design, but there are a few things you’d still like to change and customize to your liking but lack the coding skills. This is where the fabulous WordPress Theme Generator comes in handy. No coding required: That’s right no need to touch any messy lines of code. Save time & money: Yuppers, it’s FREE! Note: Site is in its early development, so the editor area only works on Firefox & Chrome browsers. This is so cool… Gonna try and see how good it is. Thanks for sharing! Have you used it for any sites. I must say that this site is extremely beautiful. Well done! I personally haven’t used it full on yet…although i did doodle around with it for a bit, and found it to be extremely easy to work with not to mention awesome! !